This photograph, although in a snapshot style, conveys a lot of information through the central composition with the main aspects of the image falling centrally in the photograph too. 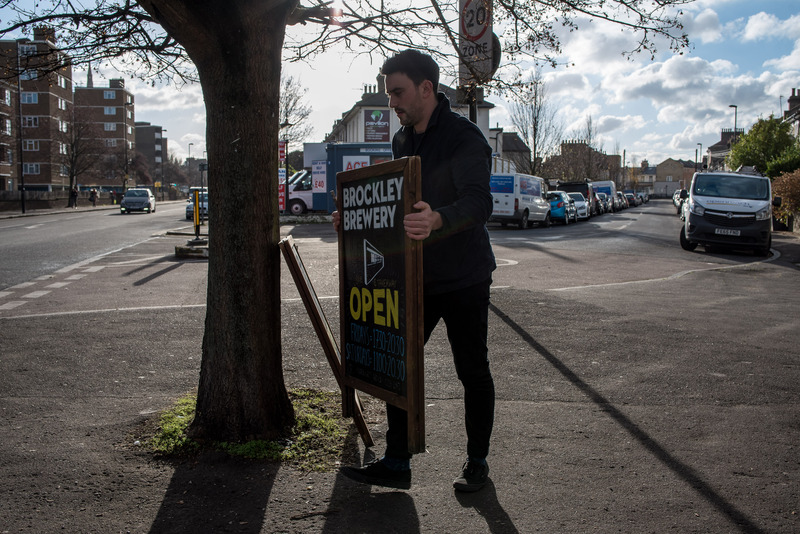 It shows one of the brewery workers putting out a sign which indicates the brewery is open for business as a bar and takeaway at certain hours of the week. It also gives a sense of environment for the brewery worker and the sign – that the brewery is perhaps nearby and what kind of area it is located in. By placing the sign and brewery worker centrally, the environment on either side acts a kind of secondary information point while the primary subjects stand out more. The sign itself is a document within the photograph, giving information concerning the brewery, while the photograph is also a document, depicting the sign and brewery worker interacting within the environment. Technically, I felt the photograph could be much better with more highlight detail and no lens flare but I was pleased with the composition and the amount of information that was conveyed. f/8, 1/250s, ISO 100, focal length 35mm, handheld.